Apple Planning to Launch 13-Inch Retina MacBook Pro This Month? 9to5mac is reporting that Apple is going to announce a 13-inch Retina MacBook Pro alongside the iPad Mini at a forthcoming product announcement event. The website cites a "consistently reliable source at a high-profile U.S. retailer", who has learned of a new, smaller version of the current 15-inch Retina MacBook Pro. According to the source, a 13-inch version of the Retina MacBoook will share the thinner, lighter style of enclosure of the 15-inch version, and will be sold in two configurations—with differing processor and storage options. 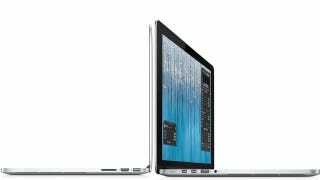 The source also claims that the 13-inch Retina MacBook will be sold alongside the standard 13-inch MacBook. The 15-inch Retina MacBook Pro was launched back in June to dropped jaws, and hinted at the future of Apple's laptop line: slim, hi-res displays, SSD-only storage and no optical drives. While a 13-inch version seemed inevitable, it remains to be seen with certainty if now is the time. Is This Why the 13-Inch MacBook Pro Display Didn&apos;t Improve?